When you hold the record for the fastest-selling classical debut album ever and have become global superstars almost overnight, you could be forgiven for a little bit of diva-like behaviour. A stretch limo at your beck-and-call, scented candles everywhere you turn, maybe even your favourite sofa flown in to sit in your dressing room for those between concert moments. But there's not so much as a bottle of Cristal on ice for The Priests. Instead, the singing clergymen are sipping bottled water and herbal tea and discussing whether their diet will allow them one of the hand-made biscuits served by the smart London hotel where they are staying. They may have signed a £1.4million record deal with Sony BMG last year, but there's nothing of the rock 'n' roll lifestyle about this jolly trio. When they pop a pill it is as likely to be for cholesterol or acid reflux - and the only substance regularly inhaled by the ensemble's baritone is asthma medication. Because, alongside God and singing, health is something these three men in dog collars have good reason to take very seriously. Father David Delargy, 46, almost died as a baby after an asthma attack left him fighting for breath, turning his lips blue, while Father Martin O'Hagan, 46, had no idea his cholesterol level was dangerously high until a routine check-up warned him that his love of rich food and fine wines was putting him at risk of a heart attack. And his brother, Father Eugene O'Hagan, 50, fearful of dying from heart failure like their mother, Joan, swims 64 lengths of a 25-metre pool at least four times a week to keep fit. 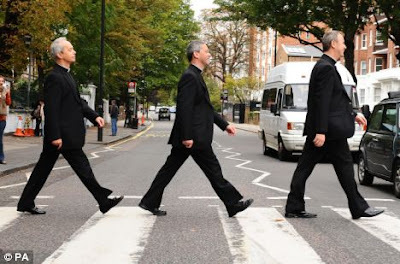 'Stress is a big factor for all of us because we have the demands of our parishes in Ireland and our singing career, which involves travelling all over the world,' says Father Eugene. No one knows this more than Father David who, until eight years ago, had a 30-a-day smoking habit - rather surprising given that he suffers severe asthma attacks. 'I was a few months old when my grandmother was bathing me one night and suddenly I started having breathing difficulties,' he says. 'I don't know how she did it but she was able to resuscitate me and took me to hospital. The doctors managed to stabilise me but told my grandmother that if she hadn't acted so fast, I would have died. 'I was back home again in a couple of days. They didn't diagnose it as asthma then, presumably because I was too young. It was just assumed to be one of those things. 'It wasn't until I was a toddler that it became obvious that ordinary things such as cat hair, house dust or feather pillows would make me short of breath. 'By the time I was at school, vigorous exercise such as football or running left me gasping for air. I was given a foul-tasting yellow syrup called Tedral once a day, which opens up the air passages of the lungs and increases the flow of air through them. It was absolute torture. 'The attacks were vicious and even when they subsided I would be left feeling drained. It took hours for me to get over it. As a result, I felt excluded from my peers socially. I was the boy who couldn't join in and I felt isolated in my school years up to the age of 11. 'Then I went on holiday to the family caravan in Cushendall, Northern Ireland, and met a boy who also had asthma but when he had an attack he took a puff from an inhaler and he was back to normal in minutes. 'It was amazing to see the instant, positive effect it had. I couldn't believe it - his asthma disappeared as quickly as it arrived. I'd never heard of Ventolin [the drug in the inhaler dilates the bronchial airways by relaxing the surrounding muscles, making it easier to breathe]. 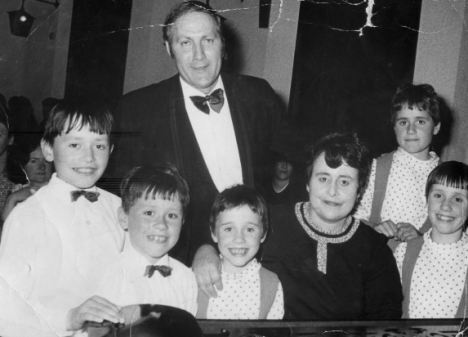 Father David had always had an interest in music, with regular family sing-songs around the piano, and realised that the deep-breathing exercises to train his voice also helped expand his lungs, allowing more air into them and lessening his bouts of asthma. He went on to attend St MacNissi's College, a boarding school in Antrim, at the age of 12, where he met Martin and Eugene, both tenors, and they began their collaboration as singers. They completed their seminary training at the Gregorian University in Rome, where their voices earned them an invitation to perform the sacred liturgy for Pope John Paul II at the Vatican. They would have continued as a part-time local act but a scout from Sony found a demo tape of the trio while searching for individual male voices for a Latin Mass album. Almost immediately, executives were muttering about potential and The Priests were launched on to the world stage. Partly as an act of rebellion and partly to look cool and finally fit in at school, Father David admits he took up smoking at 17, and for the next 21 years was seen with a cigarette in one hand and an inhaler in the other. 'I'd wake up in the morning, take a puff of inhaler then have a cigarette. I tried to give up - sometimes I'd do it for six months, maybe a couple of weeks. The anti-smoking drug works in the brain to help break addiction by modifying two neurotransmitters involved in nicotine addiction and withdrawal. It is usually prescribed for two months. Zyban is a controversial drug - available on the NHS since 2000 - and can have serious side-effects such as seizures and has been implicated in suicides. 'The side-effects were terrible. I couldn't concentrate, which made it impossible to write my sermons. I'd lose my train of thought in a conversation and look like an idiot, and I couldn't sleep properly. 'I came off it after a week but I haven't smoked for eight years now,' he says, proudly. Similar to many former smokers, however, Father David's weight ballooned from 11st to nearly 15st, so he joined a gym. A year of aerobic exercise and, he says, a WeightWatchers cookbook helped him get back to the 12st he still weighs. Doctors prescribed Omeprazole to help reduce the amount of acid produced in the stomach and stop the acid reflux that was making his life a misery. He takes a tablet twice a day. The trio have it in their contract that their parish duties must always come first. They take a small percentage of the profits of their record sales - their debut album sold two million copies - and the rest goes to their parishes and charities that help retired priests. While make-up artists may come with the territory and state-oftheart mobiles keep them in touch with their parishioners, the priests have not had their heads turned. 'The glare of publicity has been more than we ever imagined,' says Father Eugene. 'Being on tour can be challenging because it is a bit of a frenzy of interviews and rehearsals and concerts each day. 'We've learned that we have to take time out for ourselves, whether it's going for a walk or having half an hour in our rooms alone,' he says. Like his brother Eugene, Father Martin credits his mother Joan, whom the duo affectionately refer to as 'Mummy', for their musical talent. 'She loved the piano, played the organ and had a wonderful voice. She had a terrific ear for music,' says Martin. 'When she had me and my twin sister Martina at the age of 26, she suffered a blood clot in her foot which travelled to her lung. She spent almost a year in hospital. Eugene adds: 'When we were youngsters, she'd take us to the local hospitals and nursing homes and we'd sing and put on concerts. I think it was a real tonic for a lot of the patients. 'Mummy later developed heart problems in her early 60s. She was overweight and needed to have her carotid arteries unblocked and a triple heart-bypass operation. 'She had to lose 3st before the surgeons would operate. She had the two operations and life then improved for her for a while but, by the age of 71, she needed to be fitted with a pacemaker and unfortunately a year later she died of heart failure,' says Father Eugene. Their father, Francis, a former civil servant, is a sprightly 94, despite having a pacemaker fitted when he was 91. 'I'm hoping we've inherited my father's gene pool but with a history of heart problems on my mother's side - her father died of a heart attack at 65 - I felt the need to look after my health, and so far I've had no problems,' says Father Eugene. 'I don't diet but I try to eat sensibly, with plenty of fruit and vegetables, although I enjoy a glass of wine now and then. Father Martin has not been so blessed. When he changed parish in 2003, a routine health examination revealed his cholesterol level was nearly seven instead of a more normal recommendation of five or below. 'The doctor wanted me to reduce the level by diet, cutting out fatty foods, alcohol and red meat and eating more fish and vegetables,' he says. By 2004, his level had dropped to five but when he moved and changed doctor again his level had jumped back to seven. 'I think that, like Father David, stress can be a factor. Part of my job was being the adviser for religious education in 150 schools. It meant a lot of driving and rushing around and it had a knock-on effect on my health. The two most widely recognised side-effects of statins are muscle pain and weakness (myopathy) and damage to the liver, but this is said to be rare.